Joe Abbrescia's full artist profile is located here. For Joe Abbrescia, painting was his life, and his true pleasure. It was his burning desire to preserve nature...his passion to capture the beauty of a flower garden, the majesty and granduer of a mountain...and, his excitement and stimulation derived in city streets and country scapes throughout the world. Susan Hallsten McGarry, Editor-in-Chief of Southwest Art Magazine once wrote about her experience viewing the plein-aire paintings of Venice created by artist, Joe Abbrescia. "To gaze at an Abbrescia painting is a remarkable experience between the artist, the viewer, and the people, places and things in the paintings". Born in New York On October 1, 1936, Joe exhibited in early childhood a strong capacity to draw and paint. With the support and encouragement of his family, Joe received formal art training at the American Academy of Art in Chicago. His talents never went unnoticed: he served as an illustrator in the U.S. Army, at its Anchorage, Alaska base; was a commercial artist for a major art studio in Chicago; and opened "The Village Art School" in Skokie, Illinois with his brothers, Dominick and John in 1965, where his unique teaching techniques were instrumental in the development of literally hundreds of aspiring painters. Dominick Abbrescia retired and closed The Village Art School in 2013. The West holds a strong attraction for creative people, artists in particular, and they still travel westward to experience its rugged landscape and to sample the unique flavor of the West. Joe Abbrescia followed this trend and left his familiar eastern setting, moving first to Montana, then to Arizona, and then back to Montana in 1992 where he and his wife, Sue, a potter herself, made Kalispell their permanent home and established the Abbrescia Fine Art Studios and Gallery where they showcased their work until Joe passed away and Sue Abbrescia retired from the business. Joe Abbrescia Jr. now represents the artwork of his father and incorporated the art gallery with the Abbrescia Art Restoration Studio; both of which are in a gallery space shared with Mark Ogle. The new gallery has moved just a couple of blocks to the southwest from the original Abbrescia Art Gallery. Joe has said, "I view my paintings as an opportunity to share with others my love for life, nature, and beauty...". Joe has been recognized as one of America's most accomplished impressionist painters. From cityscapes to landscapes, from figurative to wildlife, a diversity of subjects are brought to life by his tireless pursuit of excellence. 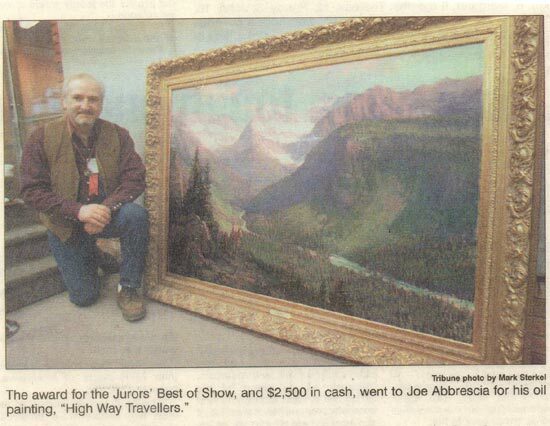 Articles featuring Joe Abbrescia and his work have been in more than 70 publications, including several issues of Southwest Art Magazine, Artists of the Rockies and the Golden West, Western Art Digest and Scottsdale Scene Magazine. Among numerous awards received are "Artist of the Year" from the American Royal Western Art Association; "Best of Show" at the Eighth Annual Museum of Native American Cultures Western Art Show and Auction and most recently Joe has been a three-time "Best of Show" and a two-time "People's Choice" award recipient at the C.M. Russell Auction of Original Western Art in Great Falls, Montana. This auction is now known as "The Russell". Joe Abbrescia passed away on February 17, 2005 and will forever be missed.